The Outer Banks is more than a vacation destination, it's a state of mind that allows you the chance to get away from it all. At Points of View, nestled in the lush bayberry and live oaks, you truly feel the beauty that our fragile barrier islands represent. Centered in the exclusive Sanderling Development of Duck, this outstanding home features some of the finest panoramic views available. With just a short stroll to the lovely beaches you've come to know, Points of View is a point of pure pleasure. Inside, guests can unwind while admiring the ocean views on the top level sun decks or can swap beach stories in the central living, dining and kitchen areas. When it’s time to drift off to sleep, Points of Views’ three bedrooms are perfect havens for relaxation and include an especially decadent king master suite with full bath. This popular vacation home is in high demand, so reserve your vacation at Points of View now! 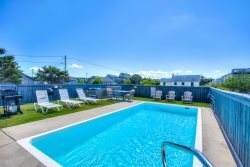 Approximately 250’ feet to beach access.